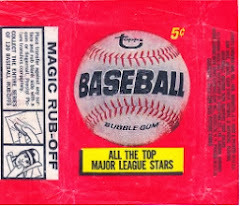 General blog note: Yesterday, I found a 1952 Topps baseball card blog. Check it out by scrolling down to my vintage year blogroll! 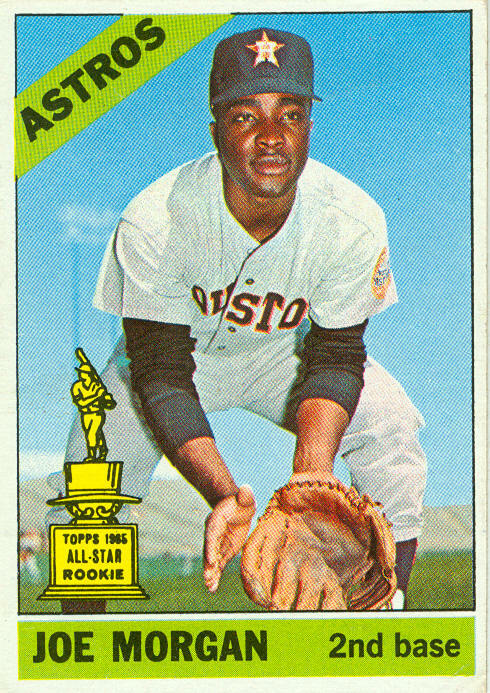 Joe Morgan was the Topps all-rookie 2nd baseman in 1965. A year later, the Astros would beef up the other side of their double-play combo. Morgan was signed by the expansion Houston Colt .45s in November 1962 (wow, that's really late in the season!). He played 2 seasons in the minors (getting brief call-ups each season). 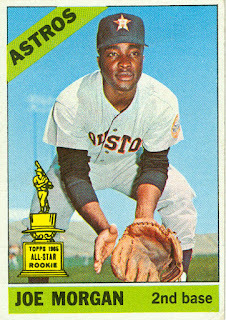 Except for missing most of the 1968 season with injuries, Morgan was a fixture at 2nd base for the Astros from 1965 to 1971, making the all-star team in '66 and '70. After the 1971 season, Joe was traded to the Cincinnati Reds (with pitcher Jack Billingham, infielder Denis Menke, and outfielders Cesar Geronimo and Ed Armbrister) for 1st baseman Lee May, 2nd baseman Tommy Helms, and utility infielder Jimmy Stewart. 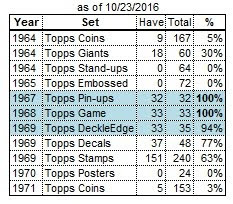 The rest is Big Red Machine history. 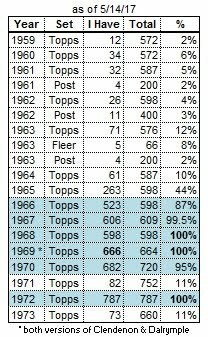 Morgan and the Reds went to the post-season 4 times in his first 5 years with the Reds, winning the World Series in '75 and '76. Joe was an all-star every season from 1972-79, and won the NL MVP award in '75 and '76. 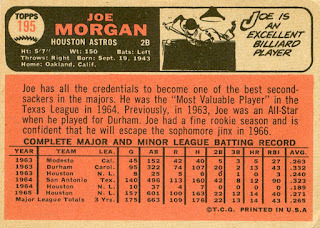 Joe left the Reds via free agency after the 1979 season, and played 5 more seasons, with the Astros, Giants, Phillies, and Athletics. In 1982, he won his only silver slugger award (at age 38). In 1983, he was reunited in Philadelphia with former Reds' teammates PETE ROSE and Tony Perez, as the Phillies went to the World Series, only to lose to the Orioles. Morgan played 22 seasons, and was his team's regular 2nd baseman right up to the end of his career.